Emily is in white at a Suzuki group class in the 1970s! The Suzuki Method is based on the combination of a weekly private lesson and group classes. The group classes serve to motivate and inspire students of all levels and ages. 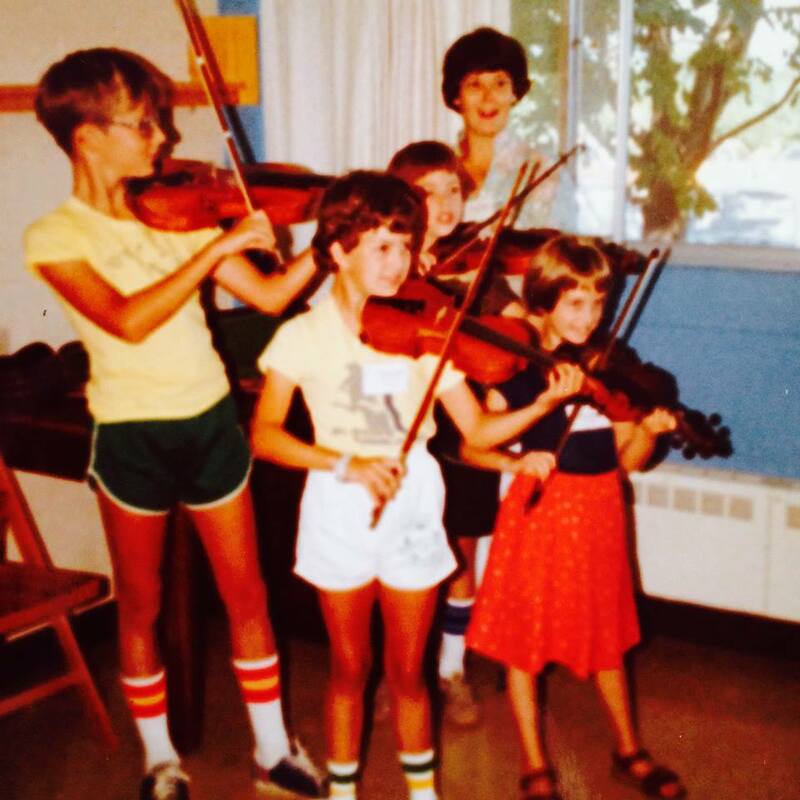 The class curriculum focuses on development and review of violin techniques relevant to students of all levels. In the group classes beginning students can play along with and model the more advanced players, inspiring them to work towards a more advanced level of playing. Meanwhile, the more advanced students work on leadership skills and ensemble playing. Playdowns (Rep Class)… A pianist is on hand and students play through the common repertoire or songs in the Suzuki books. Generally the most experienced students begin playing, and students join in to play the songs they know as they are played. Master Class… Individual students play pieces and the teacher provides feedback to the individual student while the other students observe. Regular Class… Regular group class is more free wheeling. The purpose is to help students build confidence, review skills taught in private lessons, provide motivation for practice and playing, and learn how to learn and participate in a group. The work is usually focused on reinforcing the stance of a violinist, developing endurance, reinforcing the bow hold, developing focus and concentration, and working on ensemble listening and playing. We also work on understanding and responding to discipline, boundaries, and expectations in a group classroom setting through cultivation of a special place we come together to share our music.